Along with the Freemasons, the Illuminati, and the Zionists, the Bilderberg Group is a member of that august club of organizations that in the minds of conspiracy theorists around the world, are at the helm of global affairs. According to this article from Switzerland’s Suedostschweiz, which includes a letter from Swiss MP Dominique Baettig calling for the arrest of U.S. officials, the group is rumored to be meeting in St. Moritz, Switzerland – starting today. St. Moritz: For some it is a kind of “world government,” for others, it’s simply an outdated, elitist discussion group. But one thing is clear: the participants are influential figures from politics, the nobility and the military, as well from political, economic, and media circles. 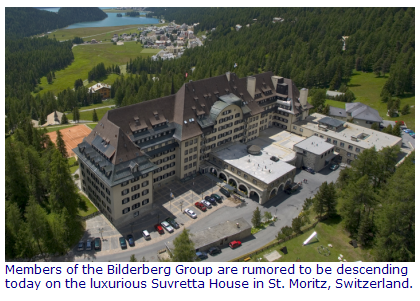 Whether the Bilderberg Group will actually meet in St. Moritz – which would be the fifth time on Swiss soil – hasn’t been confirmed. Inquiring where the event will supposedly take place at the luxury hotel Suvretta House leads nowhere. The head of reception asserted that all he could tell us was that the hotel would be open on June 25th. I write to you as a citizen in a democracy to inform you, as the responsible government representative, of my concerns referenced above. Therefore, it would be good if you would first familiarize yourself with my letter to Federal Counselor Simonetta Sommaruga, and then, after appropriate consultation with Federal Prosecutor Erwin Beyeler, take all necessary measures, should certain Bilderberg participants – at least Messieurs Bush, Kissinger, Cheney, Perle, etc. – seek to avoid a “Bush-Cointrin” or a “Polansky-Kloten” scenario, to arrest these individuals at Samedan or St. Moritz Airports for potential delivery into the hands of the various courts of jurisdiction (The Hague, etc. ).